The Social media giant Facebook is working on a laptop sized touchscreen" and to be announced next year, according to a report from Bloomberg on Tuesday. despite still being in the prototype phase. 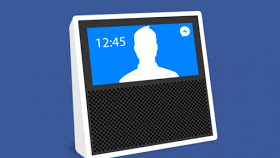 Both devices will reportedly be powered by a Facebook voice assistant that functions similarly to Apple's Siri. The new devices represent a new phase in Facebook’s hardware ambitions.